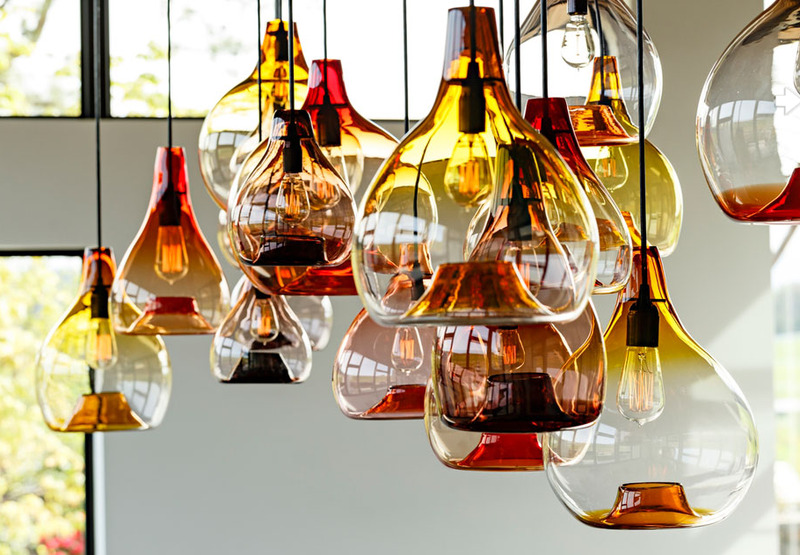 A unique characteristic of handblown glass is its ability to transform the atmosphere of a room while providing functionality simultaneously. Many times when we speak to clients they are looking to add an element of art to their space. As we head into the new year and endure the dreary months of winter, its important to understand that fresh starts can often extend beyond personal goals. Now is a great time to not just transform yourself, but transform your space. Painting a room, swapping out pillows and rehanging art all make a difference, but one of the easiest and often overlooked transformations can come from changing the lighting. Lighting is an element of your space that can change the entire mood and style. One design trend we are starting to see more often, is decorative lighting, such as the Pendant Light. Whether you rent or own, swapping out a generic fixture for a pendant is an easy update that can set the stage for a room. With numerous options, adding the perfect pendant brings an element of art and style and is sure to brighten to any room. Pendant light fixtures are suspended from the ceiling by a chain, chord, or rod and can be hung individually or in clusters. What is great about this, is that depending on the area your looking to change, these lights can serve as the perfect accent, change the mood through their color and texture, or even become the primary focus and serve as functional art piece. All handblown by artists Andi Kovel and Justin Parker, the pendants below vary in price and size to fit any budget and space. Colors come in Eco Black or White Satin with a matching black or white canopy and chord. Sizes vary from small to medium and length is customizable. Adding the element of fluidity The Flatlander Pendant is inspired by the desolate landscapes and silhouettes of water towers. Clustered together or hung separately its satin finish embodies both elegance and style, and with two different options, is a versatile piece to compliment your existing decor. This is a perfect piece for someone looking to add an element of character, creativity, and urban playfulness to any space. Pendants come two sizes. Small for use of multiple fixtures or large for single use to provide adequate light for a dining space. Colors vary and can be customized upon request. The Simple Pendant is the ideal fixture for budget friendly updates. This fixture is easy to install but completely adds a whole new dimension to a space. The smaller size is perfect for adding accents over a bar or hallway and the larger size is blown to provide the perfect amount of lighting for individual use over a dining table. This pendant is a classic piece and its simplicity paired with vibrant colors adds just the right elements to brighten up your space. Featured in Interior Design, the Crag Pendant transcends materialism by evoking stone and rocks. This eye catching pendant is hung by a brass fixture and chain and the elements of this pendant are rich with texture and elegance. The organic form of this pendant makes it the perfect fit for those looking to add an earthy element of art and style to their space. When adding a pendant light to your room don't feel obligated to match the colors and textures with your existing decor. Many pendants such as the The Dégrade Pendant have the ability to transform the space almost as if they were created just for it. What is great about the The Dégradé pendant is it evokes an almost ethereal vibe with its soft hues, fluid shape, and stunning brass fixture, rod and canopy. An instant classic, this pendant highlights pure form and hue is sure to compliment any space and design.